Indonesia is still struggling to meet all disaster response needs of the massive quake and tsunami that struck Sulawesi island last week. Now they’re faced with another mounting crisis brought by a new disaster. A volcano erupted on Wednesday on the same central Indonesian island, triggering officials to warn planes about volcanic ash in the air. 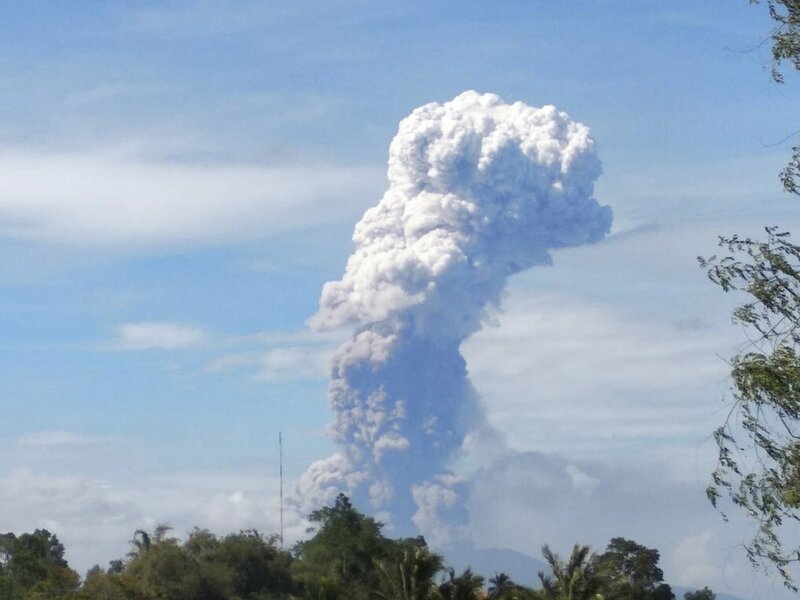 Mount Soputan on Sulawesi island spewed massive amount of ash more than 6,000 meters in the sky. A government volcanologist said that while it is not conclusive yet, it is likely that the eruption was accelerated by the 7.5 magnitude quake that hit the island on Friday. Other experts have also expressed their views, saying, however, that there’s not enough data to link the two events- the earthquake and the volcanic eruption. Volcanic eruptions are normal occurrences in Indonesia as the biggest nation in Southeast Asia sits on the seismically active Pacific “Ring of Fire,” and Soputan volcano happens to be one of the most active volcanoes on the island. There are more than 120 active volcanoes in the country of 250 million people. No evacuations were immediately ordered after the eruption. Soputan’s eruption status was raised from an alert to standby 4 kilometers from the summit and up to 6.5 km to the west-southwest. A standby status entails warning the public to avoid the area nearest the volcano. People are also advised to wear masks in the event of ash fall. Planes passing by were given adequate warnings about ash clouds because volcanic ash is considered hazardous for aircraft’s engines. National disaster agency spokesman Sutopo Purwo Nugroho also gave assurances that the said volcanic eruption will not affect planes transporting aid and supplies to the disaster-hit areas. The quake and tsunami’s casualty toll rose to 1,407 on Wednesday and unfortunately is still expected to increase further. Thousands of others were injured from the twin disasters, and 70,000 have been displaced from their homes.